A well-known writer of Perth was trying to finish an article he had commenced earlier In the day. He had the main part thought out, the motif embodied, and the local color pigmented. After waiting for an hour or so, he was smitten by a suitable inspiration, and worked back on to it for all he was worth. Rapidly he wrote, eagerly he penned the pregnant sentences that were to gild and glorify the pages of a well known publication. The man who had promised to turn in the article before 6 o’clock that evening threw down his pen, took out a pipe, and proceeded to pass five minutes away in worship at the shrine of Nicotine. The ukulele kept at it. The scribe looked at the clock, saw he would have to do something drastic; either the ukulele would cease or he would have to do so himself. And he had such a fine subject for his breadwinner! He put his head down again, but the idiotic twanging continued. Tinkle-tum, tinkle-tum; twing twang-twong; click-clack-clook! His nerves were on edge, his temper aflame, and his hand fit for homicide. The torture continued. Ting-tang-tinkle-tankle; pling-plang plong! The man who should have been putting on paper imperishable thoughts and lofty ideals rose angrily from his chair. Then he calmed himself and strode steadily to where the suburban Orpheus was twanging the catgut of his unlovely lyre. The writer himself was diplomatic, as he himself was a bit behindhand with his board, and the new arrival was fairly financial. “Is it possible, to hire one of those instruments?” he asked agreeably. The plucker of inharmonious string thought it was, in fact, he was sure. “How much an hour would anyone charge me for one of those instruments?” asked the wielder of the grey goose-quill. “Good, said the relieved writer, producing half-a-crown, “could you loan me yours for two hours for this?” and he held out the half-caser. The other could. And did. The overjoyed writer took the ukulele, carried it to his own room, and locked it away securely in a strong cabin trunk. Then he finished his article and got numerous half-crowns for it. 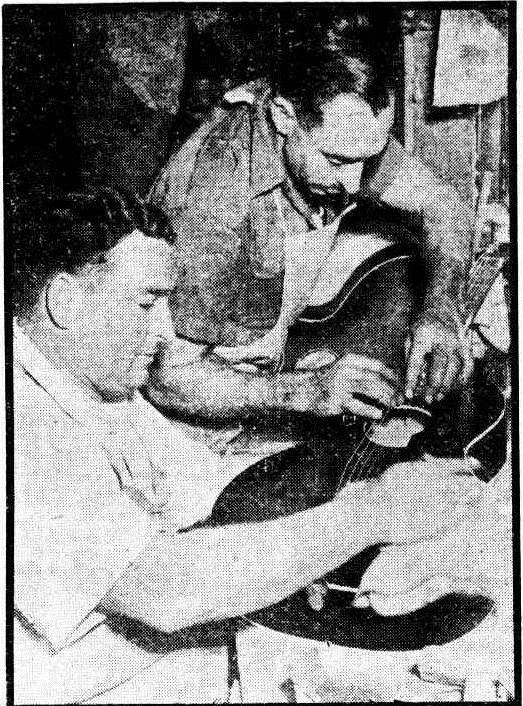 The Perth Mirror of 4 July 1953 featured Cliff Adam’s Hawaiian Ensemble. Cliff was 10 years an entertainer — as a dancer, guitarist, band-leader — until a serious illness put an end to his dancing. While recovering from a major operation, he refined his guitar skills to a very high level. 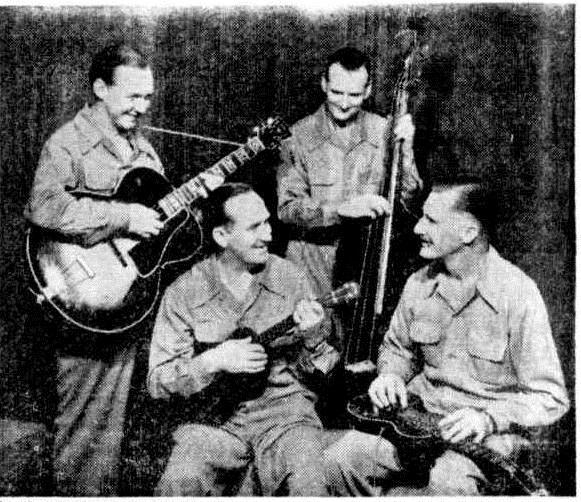 He also did radio broadcasts, and entertained troops with Hal Lashwood and Roy Rene (Mo) and many others during the 2nd world war. His Hawaiian band played 3 years with the Australian Broadcasting Commission with great success. The band consisted of one steel guitar. a ukulele, a double bass and an electric slide. From left to right we have: Cliff Adam, Wally Hadley, Dave Gillard, and Morry Maurice.